Ahmedabad: The Gujarat State Finals of the Rural IT Quiz program conducted on 22nd September at the Town Hall, Gandhinagar saw an overwhelming response with students and teachers from 33 districts of Gujarat participating in the program. The Rural IT Quiz programme is conceptualized and organized by the Dept. of IT, BT and Science and Technology, Government of Karnataka in association with Tata Consultancy Services (TCS) across the States of Gujarat, Maharashtra, Chattisgarh, Madhya Pradesh, Rajasthan and Karnataka. The Gujarat Council on Science & Technology (GUJCOST), working under the aegis of the Department of Science & Technology, Government of Gujarat coordinated the programme through its Community Science Centre network across the state. Over 600 students from Std. VIII to XII, from 33 districts of Gujarat were selected at district level competition to participate in the state level competitions held at Town Hall, Gandhinagar on 22nd September. In addition, Teachers and Coordinators of Community Science Centres were also invited to witness the program. The quiz was based on the theme of Digital Marketing and its significance in present times. The animation based quiz format had the following five rounds – Landing Page, Search Engine Optimization, Higher Per Hit, Going Viral and Net Worth. Each of the rounds tested the student’s spectrum of knowledge in the IT sphere. After a preliminary written round, six teams qualified on stage for the final round. 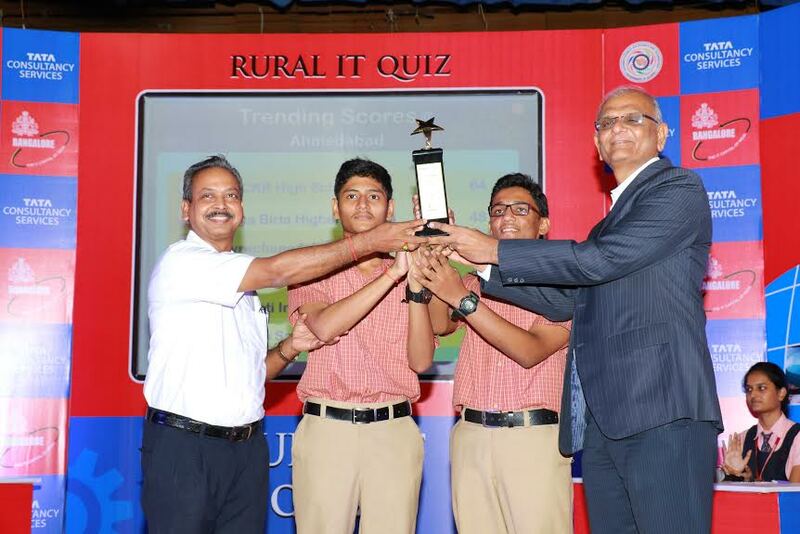 The quiz witnessed an intense battle of minds and finally – Viraj Shah and Kartik Shah from Shri Mahavir Jain Charitra Kalayan Ratnashram (SMJCKR) Higher Secondary School, Ta. 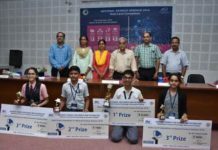 Sihor in Bhavnagar district emerged as State Champion and Sahil Bloch and Rinkal Komal, Aditya Birla Higher Secondary School, Gir Somnath were the Runners-up. The winners received TCS educational scholarship of Rs 10,000/- and the runners-up Rs 7,000/- besides other prizes. All the finalists also received bags, t-shirts, earphones and silicon bottles. All participants were also given certificates and a quiz book, with Teachers receiving a special recognition certificate. Mr. Naresh Shah – General Manager-TCS Finance Ahmedabad was the chief guest of the programme and distributed the prizes and certificates to the meritorious students. Dr. Narottam Sahoo, Advisor GUJCOST expressed that the Department of Science & Technology, Government of Gujarat has introduced a series of programmes and outreach activities among school students to make them digitally literate for exploring the future. The State Winners will now participate in the National Finals to be held at Bangalore during November where the National Winners will receive educational scholarship of Rs 1,00000/- and Runner-up Rs 50,000/- along with the to and fro air travel to Bangalore.